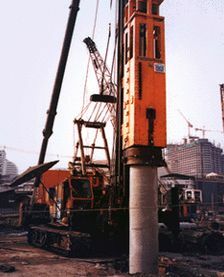 vertical drive and raker up to 1:3 without modification. possible use for suspended operations with adaptor. manual and automatic mode with one switch operation. built-in sound proofing; 80db at 30m distance on concrete pile has been recorded. sheet piling driving in threes possible on V160B series. DYNO Engineering Pte Ltd | The manufacturer reserves the right to alter specifications or equipment without notice.